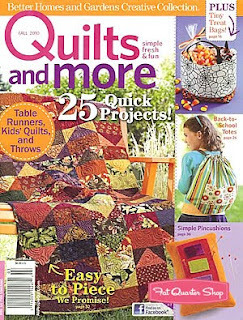 I have quilts in Quilts n More Fall 2010 magazine! Um What's that you say? I'm a cover girl? My Flight of Geese quilt made the cover. I about fell on the floor. but the day I found out. I couldn't have been more surprised. I feel like I have been holding this secret for ages. In fact, one of the quilts has been made since January! Anyhow, I am psyched to finally show them. Flight of Geese was designed very near Spring Quilt Market. What a crazy time that was! I was very happy that the great peeps at Meredith had a 'secret sewer' to sew this for the magazine. The resulting quilt is amazing and scrappy. 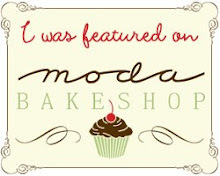 a fabric line that turned into a delicious surprise for me. and this hello yellow quilt. "Hello Yellow" is absolutely perfect for a layer cake or 2. This sews up quickly like 3-4 hours. I designed this with tweens in mind. Great visual impact with a simple shape. 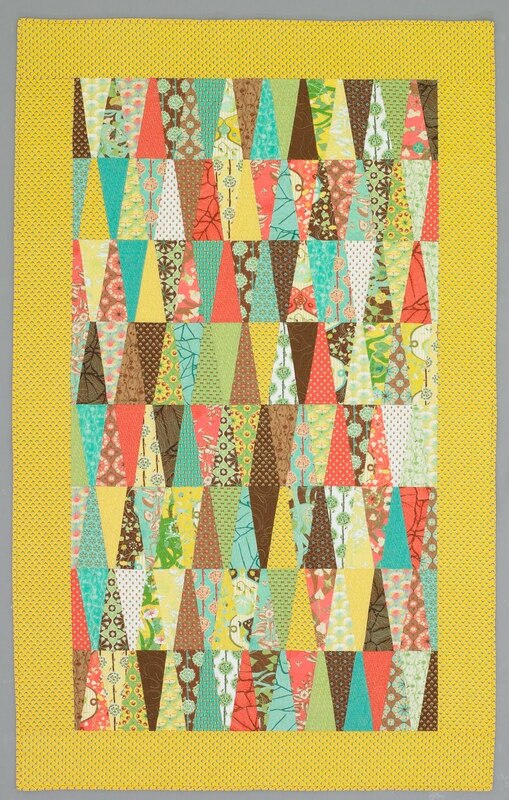 I can see this quilt made with any Moda layer cake. I think that's what's so cool about it. What do you think? would you make them? I love Hello Yellow... I just ordered a layer cake from Missouri Star Quilt this morning. It was their deal-of-the-day... This would be a great pattern for it... How big would one layer cake make? CONGRATULATIONS on your cover quilt! How exciting!! Both gorgeous quilts but Hello Yellow really speaks to me (it says, "hello..."). :-) You're right, great visual impact. Congrats again! It's beautiful and definetly Front Cover! Wow! Congratulations! A Cover Girl nonetheless! Big accomplishment! Hello Cover Girl! I am so excited for you! Gotta get my copy. Well, "Hello"...I would love to make them! Congratulations! Another celebrity is born! Love the flying geese, always a fan of scrappy! The Hello Yellow looks like it might be the perfect quilt for a dorm room bed?? If so, then the layer cake idea would be a winner...just find the right combo and it would be certain success! Love 'em both...done good! Congratulations Vickie! How fun!! I love the scrappy geese, I could see me making it and Hello Yellow would be perfect for a dorm room. Love them both! Hooray for that....how great for you? I love them both but Hello Yelloq particulary speaks to me...fantastic. Congratulations Vicki! That is some super news! Congrats to you the COVER GIRL how exciting. This is so excitting. Congrats on your cover quilt! It's beautiful! I really love your hello yellow quilt. I would definately make one! They are both wonderful quilts. Congratulations on being featured on the cover. WOW!!! Congrats to you! How fun is that! Can't wait to buy a copy for myself! 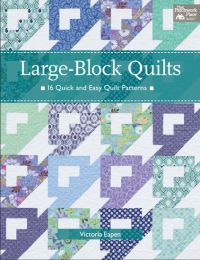 Definitely big news---how many quilters can say they are cover girls! Wonderful, wonderful happenings. I love the colors in the flying geese quilt and bet it is more gorgeous in person but it is hard to tell how big it is. I like the Hello Yellow a LOT. The wedges are a fun new way to get lots of variety in piecing. Yay for you! Good for you! The quilts are gorgeous. I'm looking forward to buying this magazine! Sure wish I could talk them into subscriptions for it! Ohhhhh! Cover girl! How great! And I would make the Hello Yellow. I think it looks really great! Hello cover girl.... How exciting for you. Great job! Hello Yellow is perfect!! What an exciting accomplishment!! I'm seeing Hello Yellow in Christmas colors for lots of Christmas trees......How awesome that would be too. Congratulations!!! I would NOT be able to keep it a secret for that long!! I would make Hello Yellow. I think it's a great design. If I did it in the right fabrics, it would be fun for my husband! Oh, now I have to hunt down QnM magazine!! Congrats on the beautiful quilts and the beautiful cover! I would love to make either of those two fabulous quilts!!! What a great secret to have to keep! Cover Girl? Yippee! Can I have your autograph? 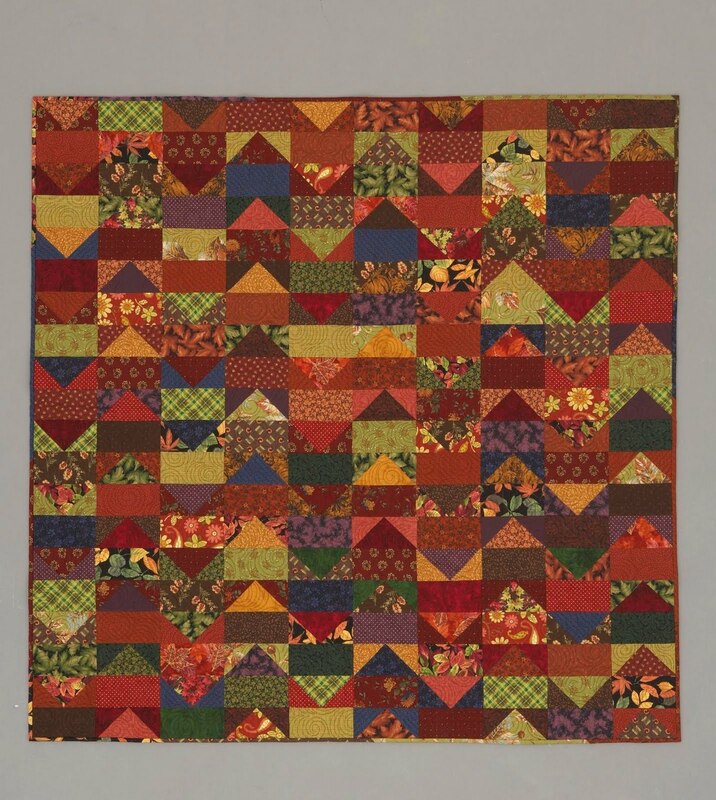 I love your fall flying geese quilt. I would most definately make it! Both quilts are adorable! Hi, I just found your blog from The Painted Quilt. I love the quilts, the colours are very pretty. Congratulations on being featured on the front cover. I'm off to check out more of your posts. WOO HOO!!! Congrats to you!!! Love your new label "Cover Girl" you getting BIG TIME!! Love the Flight of Geese Quilt. Scrappy quilts are my thing and I would definitely make this one. Congratulations what an honor...I will be looking for the magazine someone so close to home on the cover I'm trilled for you! I absolutely love the Hello Yellow quilt--definitely great for a tween or teen! Well check you out Fancy Pants! This is very exciting. LOVE Hello Yellow! Very awesome!!! I love both quilts!! Congratulations, love both quilts and yes I would make them. Love the Hello Yellow. I love both quilts! I can see Hello Yellow in Christmas fabrics, and it will give me a great excuse to buy one of those new layer cakes! And your Flight of Geese quilt is just the thing for my scrap stash! I love the autumn colors... When does the magazine hit the stores? 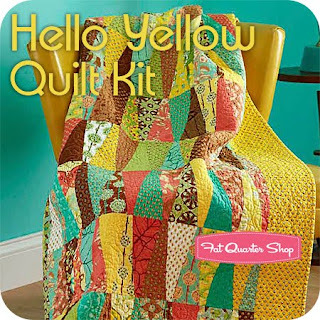 I love the hello yellow quilt! VICKIE!! Congratulations!!!!! *Happy Clapping for you* How exciting!!! 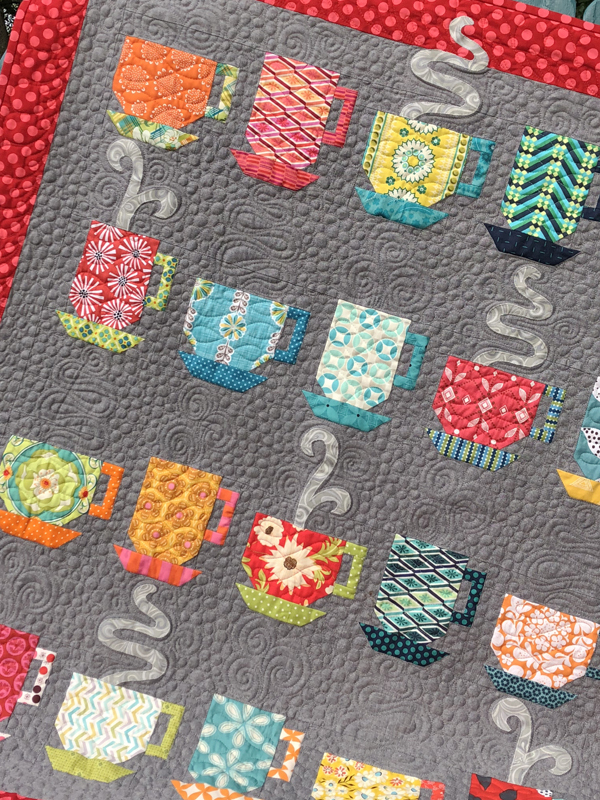 Who wouldn't love a layer cake quilt? Gotta love Hello Yello and Flight of geese...fabulous. Well now look is a celebrity these days way to go Vickie!! Well now look who is a celebrity these days way to go Vickie!! Congratulations on your cover quilt!!! Woo-Hoo! I love it, absolutley gorgeous and not too "geesy." I want to make it! Yay!! Congratulations, Vickie! I can definitely feel your enthusiasm. It just can't get any better than this! Great job Vickie! The cover is wonderful and I love the Hello Yellow quilt! Congratulations! A big huge congratulations, covergirl! Congratulations, Vickie!!! What an honor....I love both quilts. The Hello Yellow speaks to me too...I love yellow, everything goes with it! Congratulations cover girl!!! That must be such a wonderful milestone. 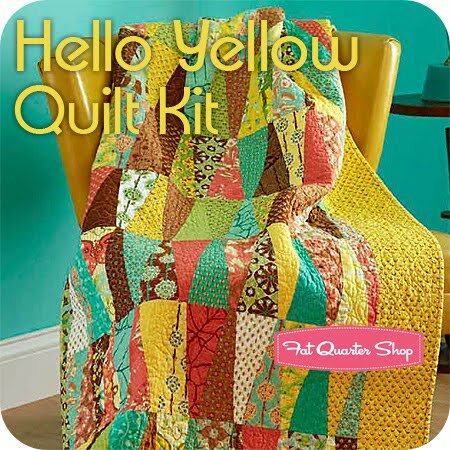 I love the Hello Yellow quilt. The colours are just scrupmtious. Can't wait for my copy of the mag to see how to make one. Great stuff!!!! Congrats! I would definitely sew up a Hello Yellow - love it! They are both amazing quilts Vickie! Congratulations - and you're a cover girl too! Yeah! I would make both of them! hey, way to go!! 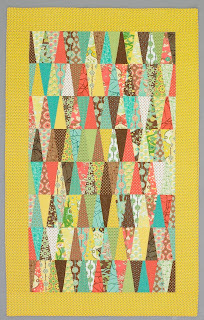 I am actually working on a FG quilt similar to that. and love that Hello Yellow one! Wow, a cover girl! and I knew you when!! should have gotten an autograph then! So I just got the magazine tonight and am heading downstairs to enjoy it...Congrats again! I now have the fall issue of "Quilts & More" and LOVE your fall quilt. Actually, if I was not already overloaded with unfinished projects, a few of which I HAVE to finish, and soon, I'd be cutting fabrics for this one now! As autumn is my favorite season, I have quite a stash of the fabrics I'll need to make this beauty. Earlier this week, hubby and myself went to Frankenmuth, MI (famous for their chicken dinners) and discovered a new quilt shop there. 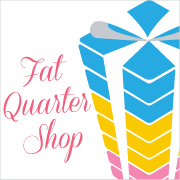 That is where I bought the new "Quilts & More" plus some gorgeous fabrics. Congratulations! The cover quilt is gorgeous. I just picked up this magazine the other day and was drooling over it. You are very talented! !